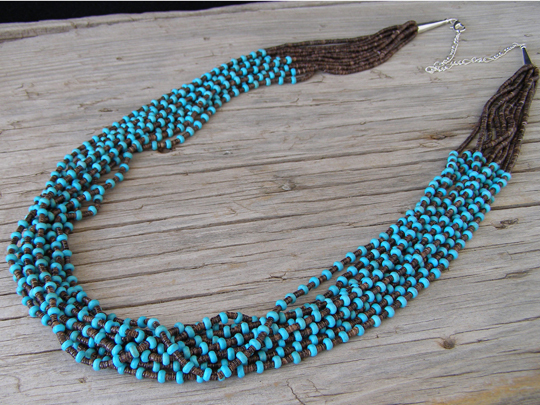 This ten strand necklace by Josephine Coriz of Santo Domingo (Kewa) Pueblo is a wonderful combination of Kingman turquoise rolled (rounded edges) heishi and fine-diameter baby olive shell heishi. The color contrast is sensational and the combination of the two beads renders the strands very fluid and imparts excellent movement to the necklace. At 29" in length, this is a full-length necklace. It also has an additional 5-inch extension chain so that it can be worn up to a length of 34". A long necklace of ten silky strands such as this has superb sway and movement in the wearing. The strands finish with runs of baby olive shell heishi which terminate at Sterling cones at the catch.